Overall the portfolio suffered a small loss of -£19.34 on the week. Interestingly enough if I had backed all of the selections from The Market Examiner and Bechers Brook my Portfolio Lite would have made a huge profit for the week due to both services finding winning selections that I did not back because of the changes to my portfolio that I outlined in this post: Here’s Why My Portfolio Lite Is Getting Even Lighter!. However I knew that these sorts of situations would arise and I can honestly say that I am quite content with the way that I am running the portfolio now and as the name of my blog indicates my focus is on the long term results which I am sure will remain in positive territory for the portfolio. My Free Eachway Tips was the biggest loser on the week (-£14.44). JERRY'S BEST BETS did not have any bets in the week and is showing a loss over all but that is mainly down to only putting up a small amount of selections since I added his selections to my Portfolio Lite, on past performance I know that this situation will change as the flat season gets into full swing. 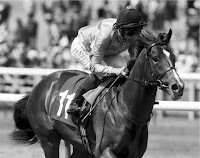 I have added High Class Equine (HCE) because even though they will be sending out there selections any day now so I want to get the structure of my reporting in place before that busy time, also I thought that if anyone was following the tipsters in my portfolio, it will give you ample time to check the High Class Equine (HCE) out. The Market Examiner suffered a small loss on the week(-£1.22) but is still in positive territory. Bechers Brook was the only member of the portfolio portfolio that made a profit (£8.32). My 16+ Runner Handicap was the second biggest loser on the week (-£12.00) however at the kind of odds that method is based on there are bound to be losing runs. Finally I am planning on adding another free service to the portfolio which I will introduce in a post tomorrow. On the back of your blog I have taken a closer look at the market examiner site and also the becher's brook blog. Both look like very interesting sites, with a good chance of making some good long-term profits. How do you pick their "best" tip of the day? Is it just the one in the first email or at the top of the list? I can't comment for market examiner but it seems on Bechers he just lists the meetings in afternoon/evening and then alphabetical order. With regards to the market examiner; I look for the selection with the highest points value, if the points value is the same for one or more selections, I go for the selection with the longest odds, if the odds are the same I do have to use my discretion but that does not happen very often. With regards to Bechers I use a similar selection criteria but I have changed it slightly because he does some times back a short priced selection with a high points value and I do not really want to back his short priced selections. So I now back the EACHWAY selection that has the highest points value, or if the point values are the same the selection with the highest odds. If the selection loses, I lose the win stake plus a small proportion of place bet. I use a calculator that I designed to do the calculations. There are occasions such as 16+ runner handicaps where I leave the eachway bet to run because of the value contained in the place part of the bet. Just in case you are wondering why I go to the trouble of laying some of the place part of the eachway bet it is because generally the straight win bet is the bet that contains the most value, however you do get longer losing runs. By laying part of the place the majority of the bet is win only, but the losing runs are cut down by the times when the selection places and also every bet effectively consists of the win bet and a small place bet reducing the liability for every bet that I place compared to straight eachway bets. If you would like a copy of the calculator; send me a private message on twitter with your email address and what version of excel that you use and I will send you the appropriate copy.